Roasting or baking is one of the few safe ways to cook a chicken directly from its frozen state. Roasting it thaws and starts cooking it fast enough to prevent potentially dangerous rapid bacterial growth; never slow-cook a whole frozen bird. There aren't many differences between cooking a frozen and a defrosted chicken in the oven, but there are two of note: You'll have to wait until it's thawed to truss, and the cooking time is extended by about 50 percent. Let the chicken stand at room temperature for 20 minutes or so. Otherwise, you'll have a hard time getting seasonings to stick to the icy skin. Preheat the oven to 350 degrees Fahrenheit during this time. Start at a lower temperature to gently thaw and cook it, reserving higher heat for the end to brown and crisp the skin. Prep your roasting pan, too, by covering the bottom of the pan with foil and greasing the rack with nonstick spray. Pat the skin and cavity dry with paper towels. Insert desired seasonings into the cavity; possibilities include half a lemon or orange, garlic cloves, salt and pepper and springs of fresh rosemary or thyme. Brush the skin with a heart-healthy cooking oil -- such as canola, peanut or vegetable oils that provide unsaturated fats -- rather than butter, which is high in saturated fat. Then, season it to taste using the same ingredients you put in the cavity, along with other complementary ones, if desired. Place the chicken on the rack of the roasting pan and put it into the center of the oven. 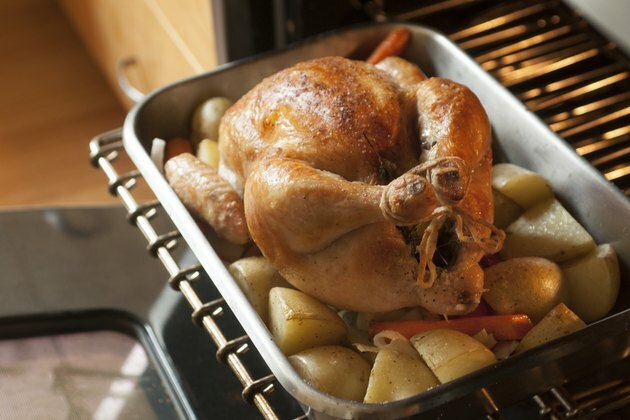 Don't cover the roasting pan, as this steams the bird, interfering with crisping and browning of the skin. Cook it for about 15 minutes to soften it up enough to truss. Take the roasting pan out of the oven. Cross the legs and bind them at the ends with cooking twine and tuck the tips of the wings under the bird. Return the roasting pan to the oven. Turn the oven temperature up to 450 F after about 75 minutes. Continue roasting the chicken uncovered for approximately another 10 to 20 minutes as needed to bring the internal temperature to 165 F at the middle of the thickest part of the breast and the innermost part of the thigh. Use a meat thermometer to confirm the poultry is safely cooked through. Transfer the chicken from the roasting pan onto a serving platter. Let it rest for 10 to 15 minutes to allow the internal juices to settle. Cut the twine off the legs and serve your meal. Don't cook a whole frozen chicken in a slow-cooker or microwave. Store defrosted chicken at or below 40 F and use it within two days of thawing. Don't leave chicken out at room temperature for longer than two hours, or out at temperatures greater than 90 F for longer than 1 hour.